When a hurricane is coming, it is not just the category number of the storm to be concerned about. Another factor is the potential rise of offshore waters caused by hurricane activity, known as a storm surge. Data on storm surges is now more readily available as hurricane experts promote an initiative to emphasize potential surge flooding and divert the public’s focus away from just the familiar hurricane categories, one through five. They say the potential impacts from storm surge flooding are often overlooked and need to be considered more fully when preparing for storms. 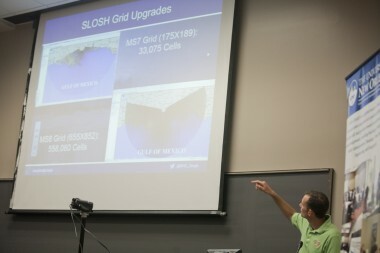 To address this problem, the National Hurricane Center announced on Wednesday that it would start publishing online maps providing coastal residents with access to real-time storm-surge data that will show expected flood levels near their homes. 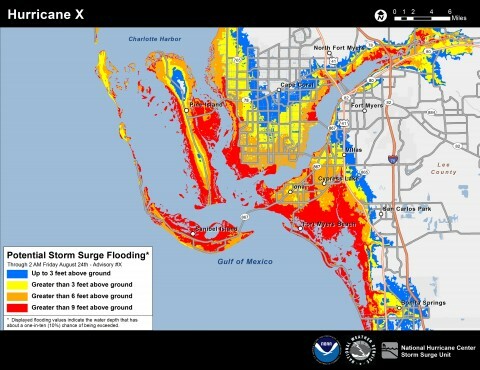 Storm-surge data has always been available to experts, but the color-coded maps are the first publicly available interactive tool to demonstrate potential flooding in a visual way. During a storm, the real-time maps will show how high water levels are expected to rise, as well as how far inland the surge should reach. The maps are expected to be available experimentally on the National Hurricane Center website this coming season 48 hours before the landfall of the first storm and will be updated every six hours, the center said. It was storm surge that caused the catastrophic damage in the New Orleans area after Hurricane Katrina. The announcement was part of the center’s annual Hurricane Awareness Tour, which made a stop in New Orleans on Wednesday. On Thursday, the National Oceanic and Atmospheric Association’s Climate Prediction Center released its 2014 Atlantic hurricane seasonal forecast. The center is forecasting a near-normal or below-normal season due to the effects of El Niño, which causes stronger wind-shear and can reduce the number of tropical storms and hurricanes. The forecast estimates between eight and 13 named storms, including three to six hurricanes, one to two of them major. Ken Graham, the meteorologist-in-charge at the National Weather Service in New Orleans, said the seasonal forecast is not a planning tool. He pointed out that the devastating hurricanes Betsy in 1965 and Andrew in 1992 occurred during El Niño seasons. “So be careful,” Mr. Graham said.